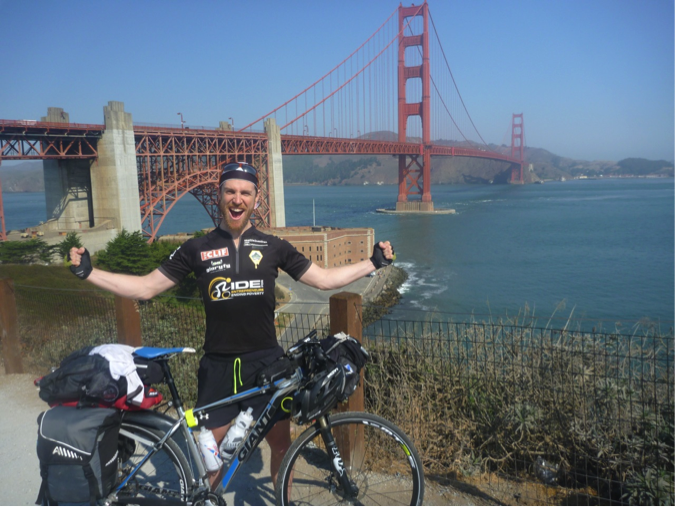 Cycling over 1000 miles from Seattle to San Francisco was tough. Doing it on $3 a day was almost impossible. However, for half those living in the developing world, less than $3 a day is a daily reality. Speaking to colleges and businesses as I pedaled down America’s west coast, I shared a message of ending poverty by enabling entrepreneurs with social business ideas. A hand up rather than a hand out! 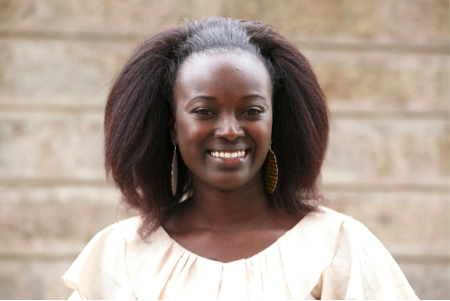 On 30 September 2014 we concluded a crowdfunding campaign, which raised over $17,000, enough to enable 15 Changemakers in Kenya. These local Kenyans with social business ideas will now get three years of support from not-for-profit Spark* International. Offering a mix of education, critical business services and funding, Spark* will give local Kenyans the tools they need to execute ideas, which will profoundly change the lives of thousands suffering poverty. So, what did I learn during this epic adventure? Here’s my top 3. Living on $3 a day is almost impossible. Camping ensured free accommodation and there was no limit to my own entrepreneurial ingenuity for sourcing food. (Sponsorship from Clif Bar & Company (North America’s #1 energy bar) certainly helped! Food was the biggest challenge. Ultimately, it was the kindness of strangers, $0.39 Ramen noodles and the $1 menu at McDonalds, which fuelled my engine. Science. I burned 4-5000 calories riding over 100kms every day. A lot of food is required to power that kind of effort. Morale. Sometimes, I felt like a hamster running through a maze – without the pellet as reward at the end. My pellet would have been a greasy burger, hand cut fries and a beer. Instead, I’d be eating $0.39 Ramen noodles or pita bread gifted by a stranger. It’s sobering to remember that many of the folks who subsist on less than $3 a day are doing manual labor all day. They might be hand ploughing a field or making bricks. At the end of the day, all they eat is maize and water. It’s a subsistence lifestyle. Only now can I begin to appreciate just how tough that must be. My resolve to help those suffering on less than $3 is stronger than ever. 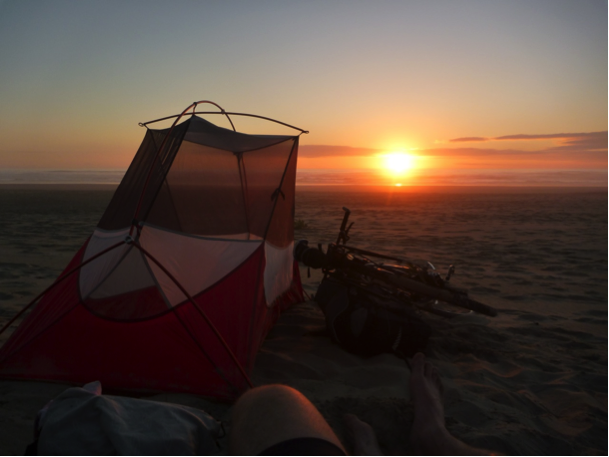 Camping on the beach in Oregon… Sometimes $3 a day is more than enough! Most people want to do good. Were it not for the kindness of strangers, I wouldn’t have made it to San Francisco. 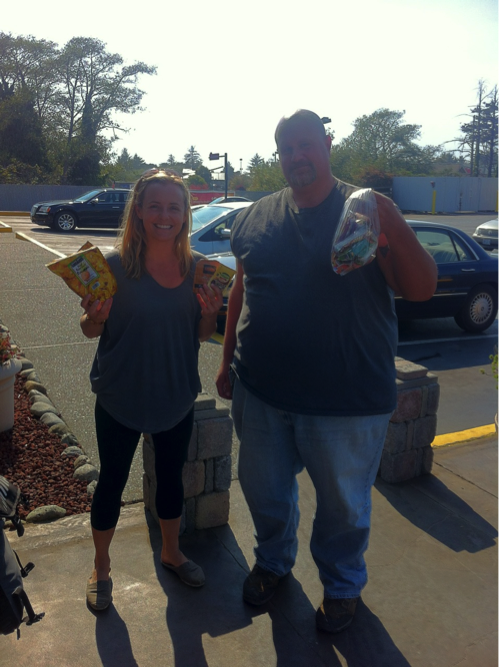 The mother on the left gave me dried pineapples and baby food, the big guy on the right overhead and handed me a giant bag of granola bars! Whether it was a park ranger letting me illegally camp in their park, a fellow cyclist giving me a peanut butter wrap or a mother handing over dried pineapple and baby food – people wanted to help. However, sometimes it was hard to ask. In a state of exhaustion all I wanted to do was eat and sleep. 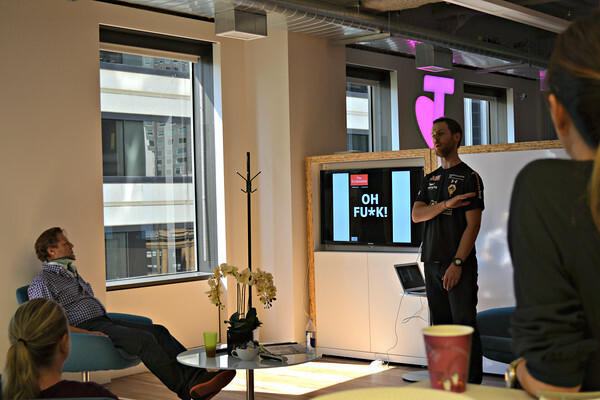 Not approach a stranger, pitch my mission and have them empathize with the cause. Aside from lack of motivation, sometimes it simply felt undignified. I had money. I didn’t need to take someone else’s food. This was a battle and something that I was challenged with internally. But, ultimately it was a positive experience for a great cause and reassuring to see that people are mostly good – especially if you give them a compelling reason to be. 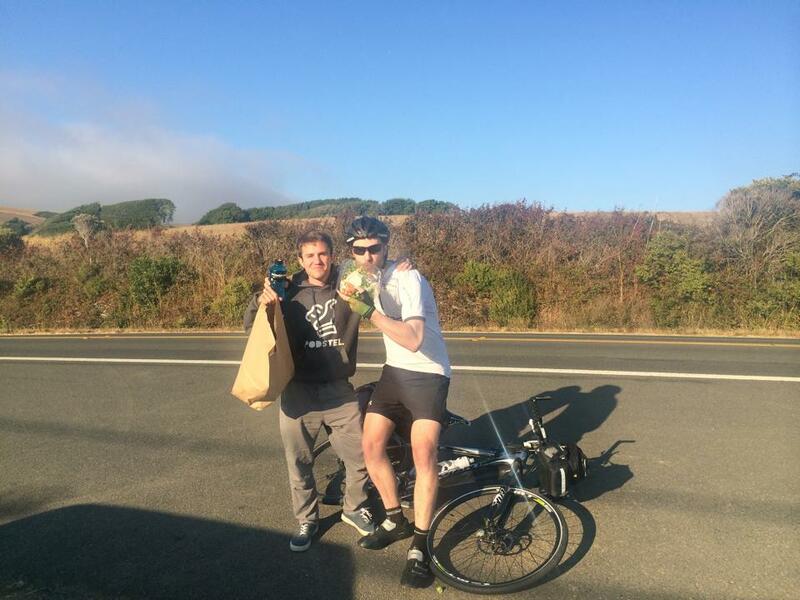 English backpacker Daniel Beaumont tracked me down on HWY 101 to deliver a giant bag of food after following the ride on social media! You learn deeply about life when you push it to the limits. Life lessons bubble up out of an adventure like this. The highs are giddying, the lows are character testing and, you get both every day. When times are good, you don’t sit back and cruise. You push harder. Inevitably, the momentum shifts. The sun disappears behind rain clouds. Two hours of flat terrain with a tailwind gives way to a quad burning hill climb with a headwind. Punctures, mechanical problems, fatigue, abusive motorists, uninspiring terrain. Sometimes you don’t even know why, but your mood drops and everything feels hard. There’s a ton of things that can and will shift momentum against you – on a bicycle and in life. But, if you’re pushing hard in the good times, your more likely to push through the tough times and shift the momentum back in your favor. Never sit back, never be complacent and keep pushing forward. Rocky Balboa nails it in this clip! Inspiration is more important than motivation. When you ride over 1000 miles solo, you get lonely. A simple smile from a stranger or an up-tempo song lifts your mood and motivates you. Stopping to read messages of support and see pledges to our crowdfunding campaign is motivating. But the most important element for success lies buried in our soul. This is where inspiration lives. If that fire is burning deep down inside, it doesn’t matter what is or isn’t happening in the outside world. It all starts and ends from within. 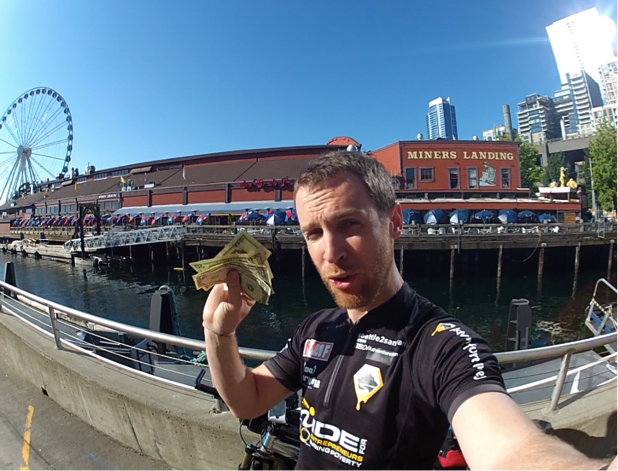 Ultimately, what got me from Seattle to San Francisco on little more than $3 a day, was driven by inspiration. It was inspired enthusiasm that convinced Clif Bar and Gloryfy Unbreakable Eyewear to sponsor the ride, strangers to provide food, kept me present during the good times and pushed me through the bad times. Words can’t describe the feeling I had when I saw the Golden Gate Bride… Mission accomplished. The inspiring people I’ve met in the poorest parts of the world lit this fire. People with the potential and motivation to change the world, but who lack the tools. Funds raised by this ride will give them the tools. By enabling them we will help end poverty. My pain is worthwhile when I know people like Caroline Odera (pictured above) will be educated, supported and given the opportunity to change the world. Caroline’s Smokeless Homes initiative is ridding shanty towns of dirty kerosene/wood fires for heating/cooking and replacing with cheaper, cleaner solar power. With Spark*’s support, Caroline will go from impacting 10s of people to 10s of thousands of people. This is what progress looks like. Thank you to everyone who helped make the Seattle2SanFran crowdfunding campaign happen, you know who you are! Links to media on Chris Ball‘s personal website.